We investigate the problem of reconstruction a surface given its contours on parallel slices. We present a branch-and-cut algorithm which computes the surface with the minimal area. This surface is assumed to be the best reconstruction since a long time. Nevertheless there were no algorithms to compute this surface. Our experiments show that the running time of our algorithm is very reasonable and that the computed surfaces are highly similar to the original surfaces. Research partially supported by the IST Programme of the EU under contract number IST-1999-14186 (ALCOM-FT). ABACUS-A Branch And CUt System. http://www.informatik.uni-koeln.de/ls_juenger/projects/abacus.html. Dr. Gill Barequet’s home page. http://www.cs.technion.ac.il/barequet/. CGAL-Computational Geometry Algorithms Library. http://www.cgal.org. LEDA (Library of Efficient Data Types and Algorithms). http://www.mpi-sb.mpg.de/LEDA/leda.html. 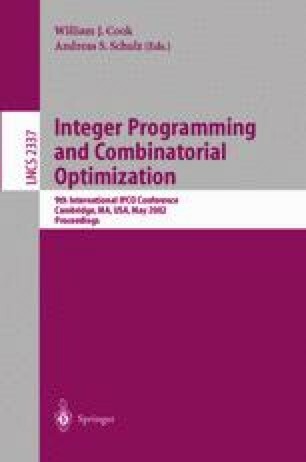 SCIL-Symbolic Constraints for Integer Linear programming. http://www.mpi-sb.mpg.de/SCIL.